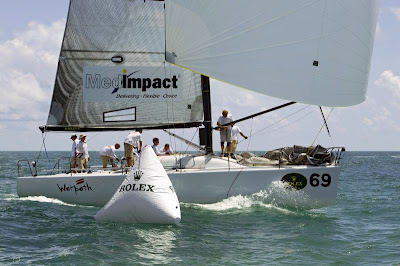 Three more race were held today in the Farr 40 warm up for next weeks World Championship. 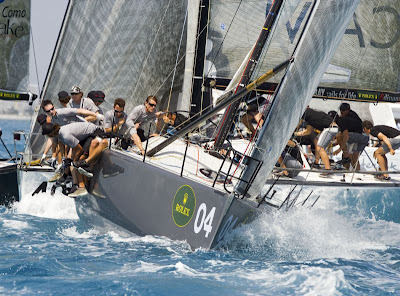 The winds were 13knots for the first races dropping to 8 knots in the third race. There were plenty of ups and downs for all competitors in the fleet. Some of the favorites had a very tough series and there were some new names at the top. On Warpath we had a decent series but had our big down moment right at the end. We were not going well at all in the 8 knots of the last race and finished 22nd. That dropped us from second to a tie for fourth overall with Fiamma of Italy. We just had our debrief with our coach Ed Reynolds and think we found a few things that we were not doing well in that lighter condition. So we will be sailing on Monday and Tuesday as we need to incorporate what we learned during the series and continue to build our confidence in our settings before the World Championship starts on Wednesday.